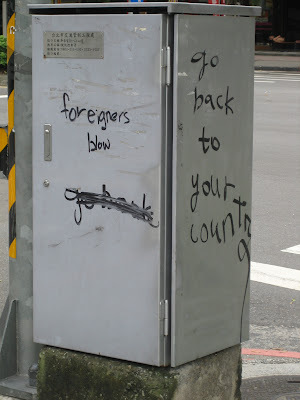 What, exactly, is it that foreigners blow, I wonder. Sigh, I know, I'm completely awful. But I pass this on my way to class every day, and it's always just begging me to take a picture of it. Literally. Begging. Heh. So do I, but I suppose I wasn't exactly their target audience. Have you seen this on your way to ShiDa? "~sob~I got nowhere else to go!" Of course, anyone who rides the MRT to Guting station to get to Shida will see this sign.. Since their target audience is foreigners that is probably their best location for such a sign. It appeared shortly after a fight at a nearby club involving some Shida students and Taiwanese guys.